Some players select a stick by measuring to the top of the hip bone, but they are never told that this method is only used for little kids and once a height of 5'3" is reached the global standard is 36.5". 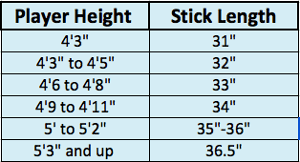 Players under 5’2’’ should follow the sizing chart below when picking the correct stick height. Once a player reaches 36.5” we highly suggest that they remain at that height. Field vision and control will greatly decrease with longer stick lengths. There are many Elite Players on the National team who are over 6 feet tall that still play with a 36.5” stick. Players with a more upright style, Pakistani or Indian technique, will need to move up in stick size when they grow past 5’10”. If you play with a Dutch Style (most Americans do) then you should stay at a 36.5” stick. A wider stance will allow better reach & hits while maintaining field vision. The bend in a stick is used to assist with lifts, aerials, drag flicks, and better maneuverability. The more bend a stick has the easier it will be for the player to have lifted shots or complete aerials. As the bend decreases, the stick can have more control and less accidentally lifted hits. For drag flicks, it is typically preferred to have a bend that is placed low on the stick and more toward the head (Late bow or Low bow). Power is measured by how much carbon is in the stick. Less carbon will allow the player to have more control and forgiveness when trapping the ball. The more carbon in the stick the more power the stick will have, but the stick will be stiffer and not as forgiving on stops. Some prefer a stiff stick since they increase the player’s ability to use deflection to their advantage. Typically beginner players should start with a low amount of carbon and then slowly work their way up as their skill level increases. There are 3 main types of head shapes on a stick: J-shape, Midi head, and Maxi head. Many players prefer the J-shape since it has more playing surface and is easier to dribble; it allows players to pass and receive more upright. Forwards who need to get off quick passes typically prefer the J-shape. The head curves up to form the letter J. Midi heads are preferred for players who like a really quick stick, since it is shorter than the J-shape and Maxi head it turns over the ball faster when dribbling. The Maxi head is larger than the Midi head, so it has an increased trapping area and sweet spot. The J-shape and Maxi head are the same length, the midi head is ¼" shorter. The power hook is an unusual head shape. The toe of the head crooks forward to create a pocket for the ball. This increases the speed of the turn over while dribbling and can help with lifts. Many players may find it hard to adjust to the unusual shape of the head, but most know right away if they love it. The weight of a stick can benefit different sets of skills that are preferred by different positions. Typically defenders prefer heavier sticks because it provides stronger block tackles. Heavier sticks or sticks with the weight concentrated in the head also provide more momentum on hits. Offensive positions typically prefer lighter weight sticks or ones with the weight distributed high up on the stick since they allow quicker stick movement for dribbling. Many players are using lighter sticks to increase speed in maneuvering and gain better control for 3D skills.